Meet 'Treat The Dog'! And don't worry; there is cat stuff too! 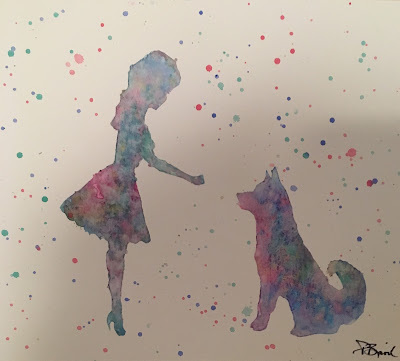 Talented people are amazing to me, and any who love animals go right to the top of my list of favorite people! Meet Pam Baril, the owner and creator of Cookie Cutter Tweets/Treat The Dog, LLC. 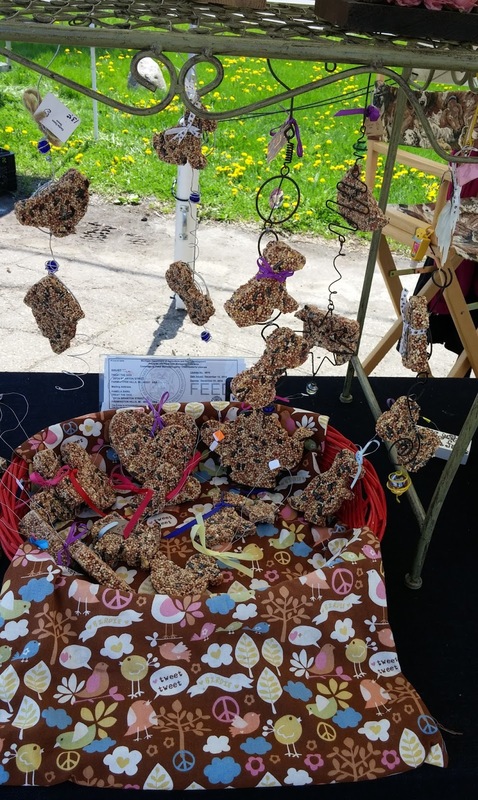 I purchased many cat toys and artwork from Pam over the years, where I've visited her booth at the hugely popular Farmington Farmers & Artisans Market in Michigan. She offers a variety of dog and bird items also, and adds new creations often. EC: Tell us about how you began Treat The Dog, LLC. PB: I’ve been in business for just over eight years, when I started selling bird seed feeders. 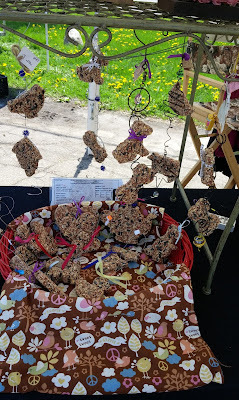 At the first farmer's market where I sold them, the market manager asked if I would consider getting licensed to sell dog treats (which I did), and the rest is history! 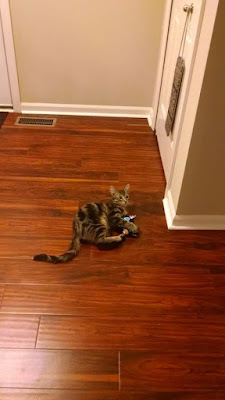 The cat people spoke, so I started making organic catnip toys, which I sell more of than any other of my pet products! 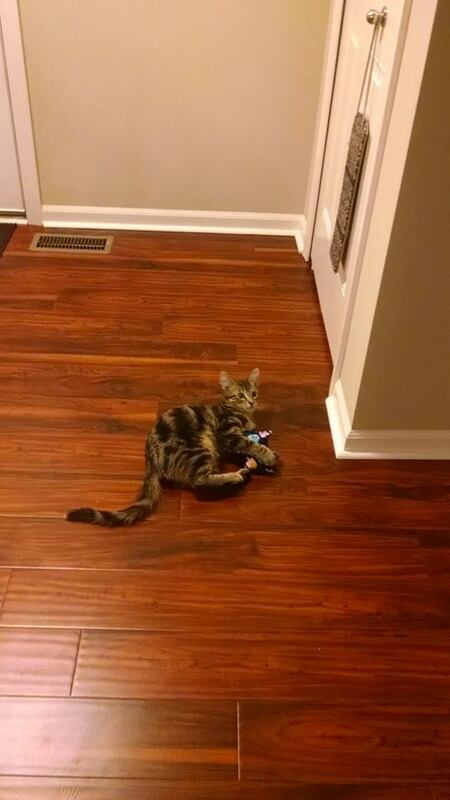 I grabbed it right away! 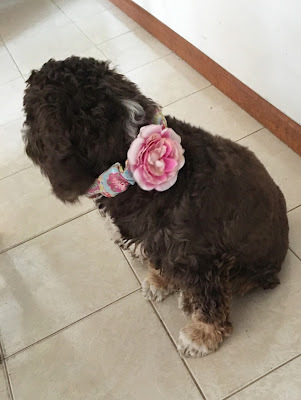 PB: I hand-make every item I sell, and although it’s a lot of hours sewing and baking, I love every minute of it! Being at my markets are “my happy places”. 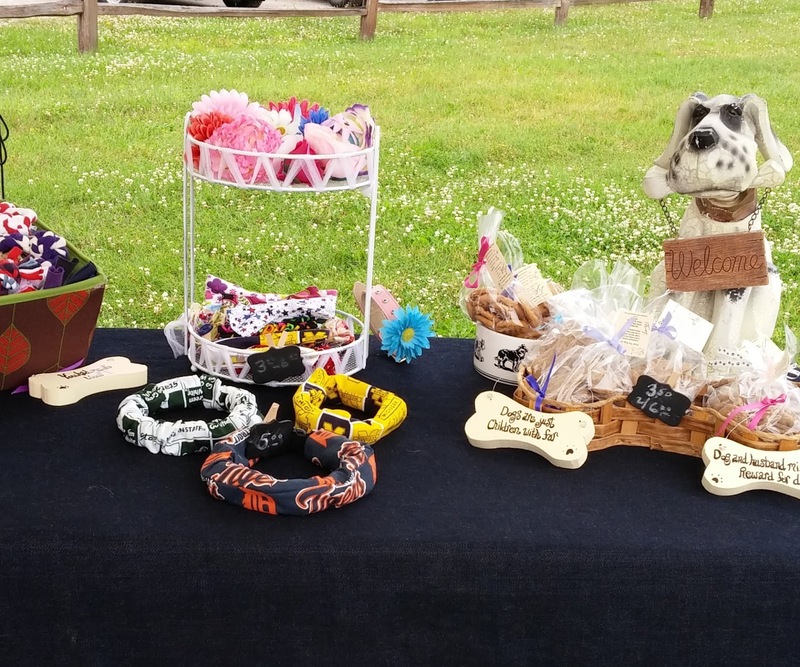 I look forward to seeing my customers, both human and furry; the dogs know I’m the treat lady, and get their sample treat when they see me. The customers that don’t have their pets with them always show me pictures. 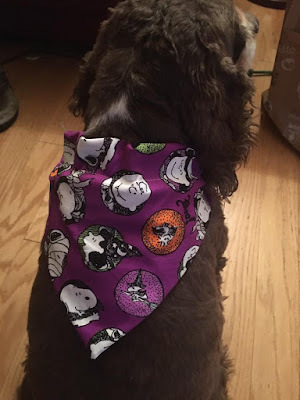 It’s a thrill seeing them wearing one my bandannas in person or a picture! 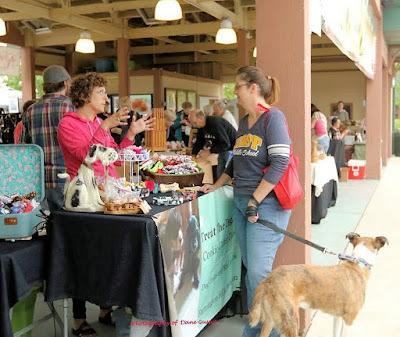 PB: One of my fondest memories is of a dog named Zoey, who would visit me at both the Northville and Farmington markets. She came to my regular space in Northville, but I wasn’t there that day, and she just stood there in disbelief. Thank you, Pam, for taking a few minutes out of your busy schedule for us today. We know you are ramping up to start the new summer season, and we know there will be lots of dogs, cats, birds… and humans in your future! Disclaimer: All photos used by permission of Pam Baril, or are my own images. I was not compensated in any way for this interview; I just really enjoy Pam's work! 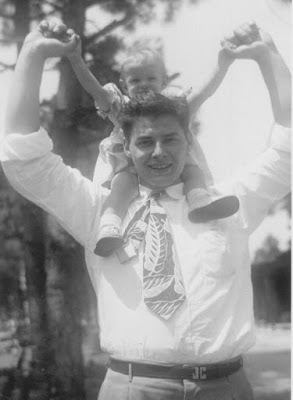 My father, whom we called "Puba", would have been 90 years old today. We lost him in May, 2004, due to health complications from the polio he'd contracted as a child. Puba never really liked animals; having six kids was more than enough chaos! The timing of his death, and The Hubby and I adopting Angel and Chuck, is more coincidence than anything. Angel and Chuck weren't born until July, 2004, but they were in utero when my father was still alive. Angel was named for my father in heaven. 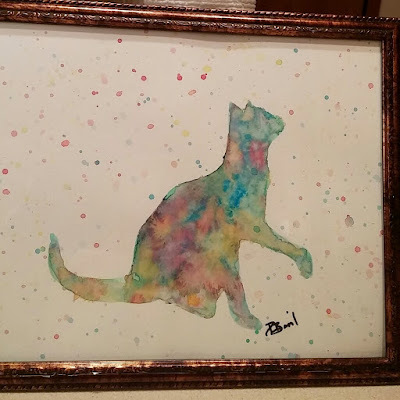 We'll never know if Puba would have enjoyed our cats, but I know he'd want us all to be happy, and to have love in our lives, and that's what cats give us…right? I just love this cat! My dear friends, the office has purchased software, where I talk to the screen and it types. I am just getting used to this process, but it may allow me to do more blogging stuff. Luckily, there are few people in the office today to listen to me! My left hand is doing well, but I need to not use it to type on the keyboard. Sunday was beautifully sunny day, and I chose to lay down for a moment after breakfast. Manny came along and slept on me! Such joy! After about 15 minutes, he moved from my lap into the shade. Guess that warm sunshine was too hot on his black furs! You see, Manny and Chili Bruce no longer sleep with me at night, because Angel has the upstairs apartment. And because I work all day and am away from home, the opportunities for Da Boyz to sleep on or with me is very limited. So, I had 15 minutes of bliss yesterday, and managed to take a photo too! Labels: Angel is as cute as a button, remember to mouse over the photos! Sure, we can tell Manny and Chili Bruce apart: Manny has large white spot on his belly; CB's is small. CB has little bald spots on his back legs caused by his attempts at imitating a meerkat; Manny has all his fur on his legs. Manny's fur is rough to the touch; CB's fur is silky smooth, and his head is smaller too. But how can I tell them apart when they both jump on me when I get home? I hope that white whisker grows back! Happy Birthday, The Hubby! ****no one noticed that I misspelled 'happy' as 'harpy'! Yep, it's a really big Birthday for The Hubby, but he didn't want any gifts. So what was I supposed to do? Deciding that something cat-related would be good, I bought a new pair of nail clippers. Now we can leave one pair upstairs for Angel, and the other stays downstairs for Manny and Chili Bruce. And I purchased these cute catnip-filled hearts too; pink for Angel, blue and green for Da Boyz. My Thankful Thursday's cup runneth over: I am so very lucky to have The Hubby as my friend, my live-in stand-up-comedian, and he's looking terrific on this warmish Spring day. Also very thankful for Dr. Kirk Cleland at St Clair Orthopaedics and Sports Medicine, PC, for putting my hand back together again! The PO'M's fur is growing back nicely, over his once bald area. Looks almost like the shape of Australia! It was a rather large area, and I am so glad that it healed. He loves getting scritches right there too! Sweetie also appears to have weathered the harsh Michigan Winter in good form. Sunday afternoons are my favorite time to sit on the deck with them, or to wander the backyard. The 'O' Cats are The Wild Bunch, not to be confused with those two wild ruffians Manny and Chili Bruce! Oh, they look peaceful here...but it's a ruse! My friends, I stumbled upon Sligo Creek Tile Co. quite by accident! First, I saw a gorgeous black cat tile of theirs while visiting The Island Cats last year, and came upon more beautiful tiles at an art show in Detroit. Finally, I screwed up my courage and sent an email. I had my tile within days! 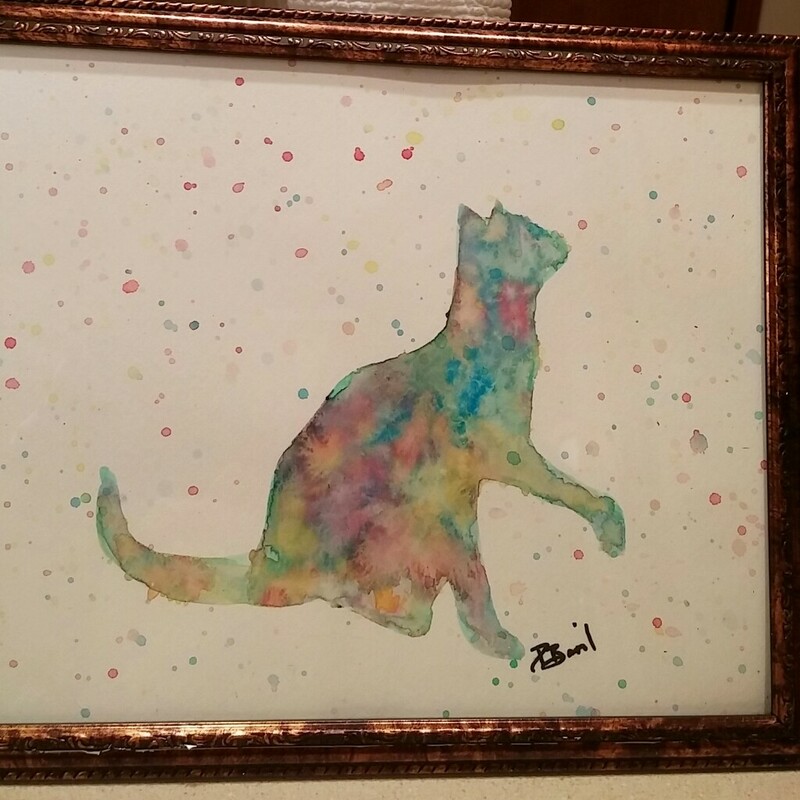 A birthday present to myself, and it enjoys a prominent display spot in my home cat art collection. Please go visit Sligo Creek Tile Co. and find some wonderful tiles for yourselves. Disclaimer: This is my personal opinion; I did not receive any compensation for posting about Sligo Creek Tile Co. 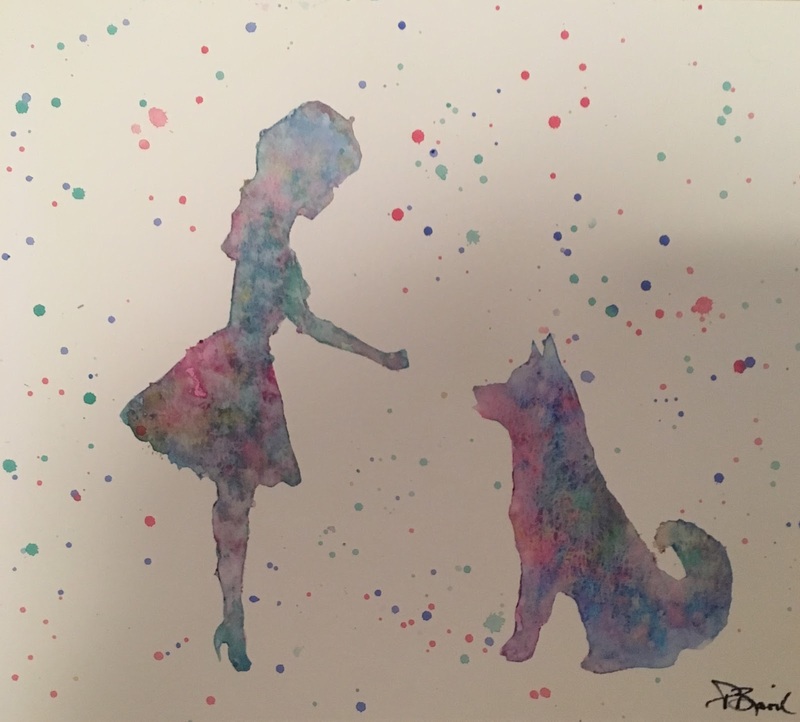 I discovered and found them on my own, and believe that you all may enjoy their artwork too! Now, taken from the outside! Labels: Manny and Chili Bruce wrecked my blind! On Tuesday, the surgeon decided that he could stabilize my broken bones with pins, and did not have to make an incision. I am thankful for that! While they wheeled me around in the hospital bed, I asked the nurses to give me a Hello Kitty cast if they had one. When I woke up, they'd drawn a cat face on a piece of tape, affixing it to my soft cast. Wasn't that sweet? The Hubby made this drawing while I was in surgery. Seriously, can these two kitties get any cuter? Double the trouble, but double the love! I spent the rest of Tuesday, and all of Wednesday at home: napping, watching seriously bad TV, and even doing a bit of work on my laptop. Today, I'm at the office, but taking it very slowly. Thank you all for the well-wishes! 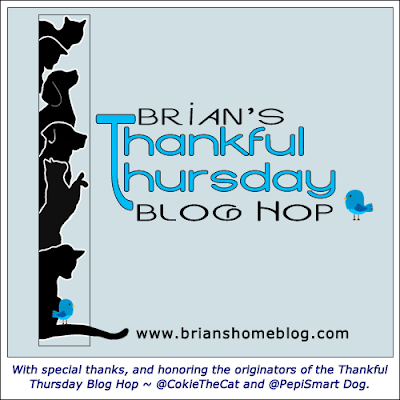 Seems more than appropriate to join Brian's Thankful Thursday Blog Hop! My hand surgery is scheduled for tomorrow, so I spent lots of quiet time with the kitties yesterday. Seriously, this cat is just too funny! Even one-handed, I can pick up and snuggle kitties...whether they want to or not! Today, the office is fairly quiet, so I'm attempting to get caught up...ha!